“Dave, I think we’re going to have a really busy day today,” BC said. Our day had begun in the Makerspace and we were preparing for that day’s work. BC alerted me that it might be a nonstop day and there would be some classes booked for the same time slot. Tables were cleared off, tools put away, inventory or materials sorted into their proper storage bins. Click on photo for more pictures. Nothing seemed unusual about how the day would proceed. The first of two STEAM classes came into the ‘clean’ side and resumed their work on projects begun earlier this semester. BC, Josh and I checked in with them periodically and offered other ideas to consider. Madame brought the first of four groups of students visiting from the CSI school in Lyon, France. They were hard at work making a memento of ‘US,’ a representation of their time spent with their FCS student host and their time visiting the US. Fabric was sewn and stuffed to make pillows. Some of these pillows were given as gifts and others were made as neck wraps for the long voyage home to Lyon. One pair of new friends shared an interest in film and music by laser cutting an image of each and compiling it into one. A blanket throw with ‘2015’ was sewn. French and American flags were laser cut and painted. A book of ‘Thank you’s illustrating shared experiences eating different foods and journeying to different places. It was only the first block of the day, but the feeling in the two rooms was electric. 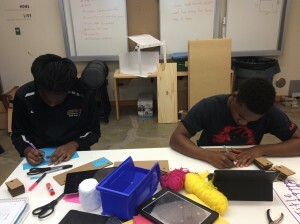 Watching and helping to support the creative problem solving was more than just fun. It was exciting. Click on photo to see more pictures. The morning continued to be electric and exciting. The second block started. Some of the French students stayed to continue working on their projects. 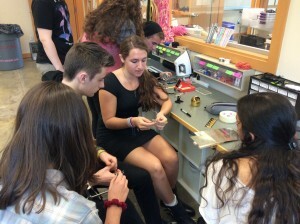 They were joined by some students of Ariel Eure’s two Grade 10 Literature classes, who returned to finish up work from an initial visit to the makerspace on the previous days. They were continuing the construction of mobiles that visualized data about modern tragedies. 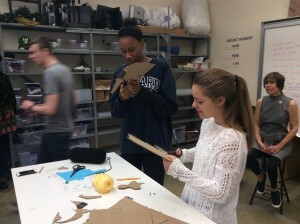 As the mythical Fates of Antigone and ancient Greece measured and cut the threads of human lives, students were measuring and cutting yarns to examine to starvation throughout the world, school shootings, sea turtle population decline, and countries accepting Syrian refugees, to name a few. Strips of yarn varying in length were shared data indicators, but the mobiles were uniquely the choice of the students as they drew, vinyl cut, laser cut, and 3D printed their own designs. One of Holly McCloskey’s Grade 9 Integrated Physical and Biological Science classes came to us at the second block. Working in groups, they were challenged to design a carrier that would support and secure an egg dropped from the roof of the FCC building. Collaboration was essential to the success of the design and each group was beginning well. Sketches were made on the table tops, research was done on iPads. Suggested materials were offered. Problems were suggested, solutions given and design modifications offered. They were on their way to making! Thursday’s Chorus block was upon us. There was a Metal Arts Club meeting, in one space and a Unity Club meeting in the other space. “I think we have 30 seconds to catch our breath,” BC said. He indicated our first and only break of the day. We had just enough time to speed straighten the spaces before the arrival of BC’s Grade 8 Computer Science class, a third class of French students “Making US” followed by our second STEAM class. These classes were double block classes too. The activity in the Makerspace continued to be electric with creative energy from exchange students and clubs, English, Science, French and STEAM classes all visiting in the same day. Overall this nonstop day in the Makerspace was amazing! It was definitely a space where students were busy making, but perhaps more importantly, it was a place where students and their teachers felt welcome to make. We invite you to accept an open invitation to the Makerspace and come feel the energy of creation.